Former state security officer Leo Demidov is struggling to change as the Soviet Union changes around him. The two young girls he adopted have yet to forgive him for his part in the death of their parents, and they are not alone; now that the truth is out, Leo and his family are in grave danger from someone consumed by the dark legacy of Leo's past. Tom Rob Smith - the author whose debut, Child 44, has been called "brilliant" (Chicago Tribune), "remarkable" (Newsweek) and "sensational" (Entertainment Weekly) - returns with an intense, suspenseful new novel: a story where the sins of the past threaten to destroy the present, where families must overcome unimaginable obstacles to save their loved ones, and where hope for a better tomorrow is found in the most unlikely of circumstances . . .
Soviet Union, 1956. Stalin is dead, and a violent regime is beginning to fracture - leaving behind a society where the police are the criminals, and the criminals are innocent. A secret speech composed by Stalin's successor Khrushchev is distributed to the entire nation. Its message: Stalin was a tyrant. Its promise: The Soviet Union will change. Facing his own personal turmoil, former state security officer Leo Demidov is also struggling to change. The two young girls he and his wife Raisa adopted have yet to forgive him for his part in the death of their parents. They are not alone. Now that the truth is out, Leo, Raisa, and their family are in grave danger from someone consumed by the dark legacy of Leo's past career. Someone transformed beyond recognition into the perfect model of vengeance. From the streets of Moscow in the throes of political upheaval, to the Siberian gulags, and to the center of the Hungarian uprising in Budapest, The Secret Speech is a breathtaking, epic novel that confirms Tom Rob Smith as one of the most exciting new authors writing today. Zoya and Elena's true parents were killed by an officer under Leo's command. Do you think Leo was morally required to take care of them? When Leo was a member of the state security force, it was his job to arrest many of his fellow citizens. To what degree should he be held responsible for his past actions, even though he was doing his duty and following orders? How do you think the political atmosphere and the role of women in society affected Fraera's transformation from a priest's wife to a vory leader? Raisa seems willing to sacrifice her relationship with Leo to save Zoya. What do you think of her decision? One has the feeling that the author has tried to cover too much territory in this single volume. He addresses not only the Secret Speech and its impact, but prison ships, gulags, the rise of the vory-v-zakone and the Hungarian Revolution of 1956. ... The biggest criticism that The Secret Speech is likely to contend with is that it's simply not as strong a novel as the first book in the series. Nevertheless, those who enjoyed Child 44 will mostly find their time well spent with The Secret Speech, and will have the third volume in this planned trilogy to look forward to. (Reviewed by Kim Kovacs). Smith remains a fiendishly intricate plotter, but this is a routine thriller crammed so full of reversals that the life is squeezed out of the characters. ... This is a novel that really, really wants to be a movie. Smith writes with finesse and authority about the post-Stalinist era, the undeterred passion of people crushed by the Soviet juggernaut and the survival of family loyalties at any cost. Disappointingly, the story that unfolds has little of the psychological tension of Child 44, nor the strong characters that made it so compulsive. ... There is much potential here for the kind of chunky thriller that both challenges and entertains. I hope the next installment will live up to the early promise. The moral conflicts just about keep pace with the tension in a narrative packed with a dizzying mass of incident. Smith has proven his brutal touch when describing human conflict. With this thriller, he offers a fierce account of fighting onboard a storm-wracked prison ship on the Sea of Okhotsk - a hair-raising scene, alone worth the cost of the book. Though its drama often lacks emotional resonance, this story paints a memorable portrait of post-Stalinist Russia at its dawn. Starred Review. A superb thriller, full of pitch-perfect atmosphere. For a history of the vory - please see the main review. The vory developed a complex series of coded tattoos that are still employed by the vory today. The tattoos have a bluish color and are blurred-looking due to the poor quality implements used to create them. Ink inside the prisons is usually created by burning the heel of a shoe and mixing the soot with urine and shampoo. 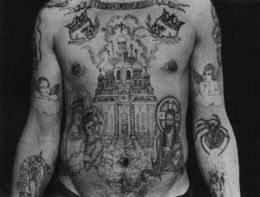 The tattoos often cause infection which, in the harsh gulag conditions of the past and the usually appalling prison conditions of today, frequently result in death. Red Plenty is history, it's fiction, it's as ambitious as Sputnik, as uncompromising as an Aeroflot flight attendant, and as different from what you were expecting as a glass of Soviet champagne. A riveting and emotionally absorbing portrait of post-war Soviet Russia, a world of violence and terror, where the severest acts of betrayal can come from the most trusted allies.